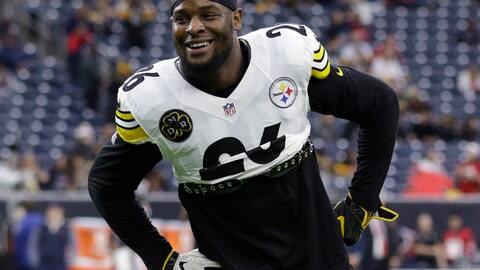 PITTSBURGH (AP) — Le’Veon Bell’s patience on the football field sets him apart. His career at a crossroads partly of his own making, Bell will have to rely on that patience now more than ever after the two-time All-Pro declined to sign his one-year, $14.4 million franchise tender with the Pittsburgh Steelers by Tuesday’s deadline, making him ineligible to play for the AFC North leaders or anyone else this season. The unprecedented move sets Bell up for the potentially big-time payday he has long been searching when he becomes a free agent in the spring, provided there’s a team willing to splurge on one of the league’s more talented if mercurial players. While TV cameras set up outside the team’s practice facility on Tuesday to catch Bell if he decided to show up for work for the first time in nearly 10 months, the 26-year-old never pulled up to the gates, ending — for now — one of the more unusual labor standoffs between a team and a player in the era of free agency. Pittsburgh coach Mike Tomlin seemed resigned to Bell’s decision shortly before the 4 p.m. deadline, saying simply “so be it” when asked about the possibility of Bell not returning to the team that selected him in the second round of the 2013 draft and helped mold him into one of the league’s most dynamic threats. Conner, third in the NFL with 771 yards rushing, remained in the concussion protocol on Tuesday after leaving last Thursday’s blowout win against Carolina but could practice as early as Wednesday. All season Tomlin stressed he was focused on the players in the locker room and not the ones outside it. He hardly seemed bothered by the idea of Pittsburgh’s quest for a postseason berth continuing without Bell. The Steelers drafted Bell with the 48th overall pick five years ago, won over by his youth, size and versatility. Along with wide receiver Antonio Brown, Bell became the linchpin in which the Steelers rebuilt themselves on the fly as the franchise’s identity shifted from away from the defense that fueled three Super Bowl appearances in six years from 2005-2010 toward an offense that ranked among the most explosive in the league. Bell is one of only three players in recent NFL history to be franchise tagged in consecutive seasons. The first two — linebacker Karlos Dansby and quarterback Kirk Cousins — played all 16 games during their second seasons under the tag then went and cashed in elsewhere in free agency. As his profile rose, Bell insisted he wasn’t merely a running back, pointing to his success as a receiver — he finished 10th in the league with 85 catches in 2017 — as proof that he should be paid far above his peers. Only he didn’t. And when preparations for Pittsburgh’s Week 1 trip to Cleveland began without Bell, several Steelers — particularly the offensive line — vented their frustrations publicly. It’s as close to breaking a sweat with the Steelers as Bell will get. Though the team could use the franchise or transition tag on Bell next spring, it’s more likely he’ll just walk away.